The Cone Calorimeter – Fire Science and Technology Inc.
ISO 5660 standard was only published in final form in 1993. However, the Cone Calorimeter was first announced in 1982. Thus, heat release rate (HRR) research work using the Cone Calorimeter started at that time, even though certain features, e.g., the smoke photometer, were not developed until a few years afterwards. In this paper a review is made of what has been learned so far and where strong research successes have been obtained. A number of applications where Cone Calorimeter data are already being used are cited. In addition, some indications are given of where Cone Calorimeter research and application activities are likely to progress in future years. During the late 1970s and early 1980s the importance of a reliable bench-scale engineering tool for measuring heat release rate was being realized. A number of such devices had already been built, both at NIST (then, NBS) and at other institutions. None was felt to be appropriate for normal engineering laboratory use. The problems were two-fold: errors of measurement, and difficulty of operation. Insulated box (sensible enthalpy) types of designs were demonstrated to show large systematic errors. Instruments built on other measurement principles, such as substitution burner, were capable of good accuracy but were very complex and difficult to install and maintain. This indicated that an instrument of a new design was needed. At the same time, the oxygen consumption principle  was beginning to be known. It shortly became evident that the successful bench-scale HRR apparatus would be based on using this measurement principle. Several years of exploratory research on various instrument designs were conducted. The successful design was termed the Cone Calorimeter and was first described in an NBS report in 1982 . The basic principle of the Cone Calorimeter has been unchanged to this day. Numerous improvements and additions were made, however, to the point that a current-day apparatus contains few parts identical to the ones on the apparatus of 1982. The most major change was the introduction of systems for measuring smoke optically and soot yield gravimetrically; these were described in 1987 . Most of the other changes involved not changes in function but, rather, parts redesigned for ease of use or reliability of operation. The design of the Cone Calorimeter, as finalized, was considered a pivotal engineering invention-it was awarded the “R&D 100 Award” in 1988. It was the first-ever fire testing apparatus to be recognized by the award to NIST of the most prestigious American award for technology innovation. The first Cone Calorimeter built outside NIST was constructed at BRI in Japan in 1985, followed by one at the University of Gent in 1986; later in that same year 3 commercial units were built and sold in the United States. Fig. 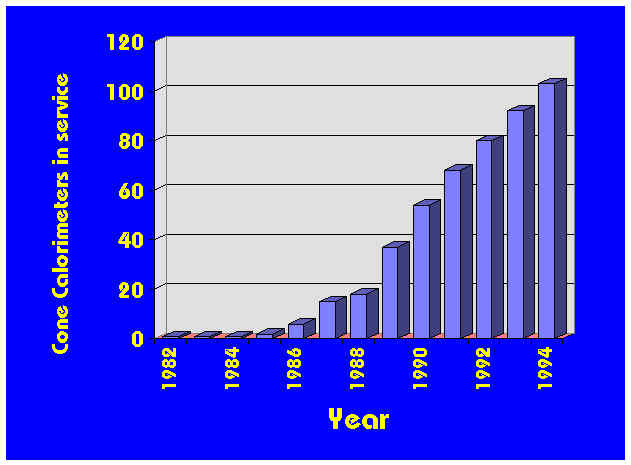 1 shows the growth of Cone Calorimeters subsequently. 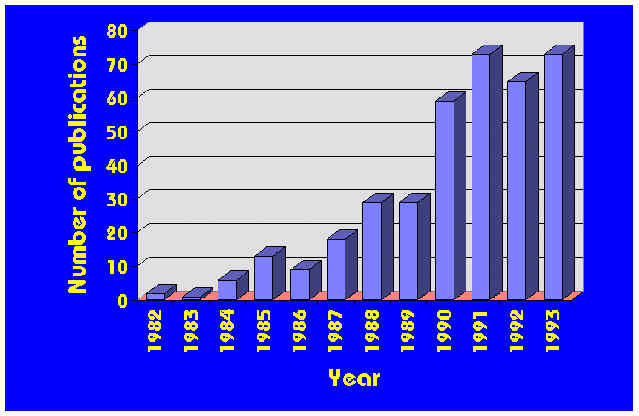 Nearly 100 units have now been established, including some which are not charted on Fig. 1 since details are not available of when they were commissioned into service. Close to 20 countries possess at least one Cone Calorimeter by now. There is currently one active manufacturer of Cone Calorimeters: Fire Testing Technology Ltd. In the past, Atlas Electric, Dark Star Research, University of Ghent, and PL Thermal Sciences produced some units. The breakdown of ownership at this point stands as indicated in Table 1. As one might expect, manufacturers’ laboratories and government research laboratories are the most common establishments possessing Cone Calorimeters. Universities as yet comprise a small fraction, but there is growing interest in that sector. For-fee testing activities take place at both the independent laboratories and, in many countries, at government research/testing laboratories; together these account for nearly 1/4 of the units. Subsequent to its standardization, instrumentation developments on the Cone Calorimeter have focused on some advanced research needs. These included extensive gas measurement facilities and controlled atmosphere Calorimeters. Because the burning environment of the Cone Calorimeter is considered to be a good representation of the majority of actual fire conditions, chemical sampling is often done as a supplement to the standard test procedures. Some gases (CO, CO2, H2O, total unburned hydrocarbons) can readily be monitored with dedicated real-time gas analyzers. Other gases (HCN, HCl, HBr, SO2, NOx, TDI) can be batch sampled, then analyzed by ion chromatography. Alternatively, Fourier Transform InfraRed (FTIR) spectrometers have been explored for real-time analysis of numerous gas species simultaneously ,. Another research development has been the construction of controlled-atmospheres Cone Calorimeters . The interests here are three-fold: (1) the ability to conduct tests at lowered oxygen levels, or in pure nitrogen, can provide significant additional insights for the polymer development chemist. (2) In some aerospace applications, atmospheres with oxygen concentrations > 21% are used; materials flammability should then be studied under those actual, more hazardous, conditions. (3) During various phases of a fire, some combustion takes place in vitiated air streams. Such burning behavior can be quantitated with a controlled-atmospheres Cone Calorimeter . Instruments capable of controlled-atmospheres work have been placed into service at NIST, NASA, Dow Chemical and other laboratories. Turning from the development of the Cone Calorimeter to its utilization, a very large number of research projects have been conducted during the last decade by the use of the Cone Calorimeter. Space does not permit discussing them in detail, but a complete bibliography has recently been published which provides citations to the papers and gives brief details on each . It is of interest to look at the total number of papers which have been published that rely on Cone Calorimeter measurements. Fig. 2 shows that in the last few years more than 50 papers a year can be counted. This is not surprising. During the 1970s it was felt that heat release rate was one of the useful variables describing fire. By the late 1980s it was realized that it was the most important single variable needed to describe fire hazard . The first standard to be published describing the use of the Cone Calorimeter was a draft standard (in their terminology a “proposal”) published by the American Society for Testing and Materials (ASTM) in 1986. It carried the designation of P 190 and is now obsolete because ASTM have subsequently published a full standard describing the Cone Calorimeter. The full standard was first issued by ASTM in 1990 under the designation “Standard Test Method for Heat and Visible Smoke Release Rates for Materials and Products using an Oxygen Consumption Calorimeter (ASTM E 1354-90).” Slight amendments were made in 1991 and 1992, with the current edition being E 1354-92. It is noteworthy that the ASTM standard does not merely refer to the measuring of heat release rate alone. On the international scene, the International Organization for Standardization (ISO) had been seeking to develop a bench-scale HRR apparatus ever since the mid-1970s. Efforts were commissioned in the UK to have an apparatus designed to this purpose, but success was not achieved. In the early 1980s ISO revisited this issue, and the convener of its Working Group ISO TC 92/SC1/WG5, Dr. Marc Janssens, conducted a world-wide canvass to determine if an apparatus suitable to ISO could be found already designed and operational somewhere. The ISO assessment was that the NBS Cone Calorimeter was the best apparatus upon which to base the needed ISO standard for heat release rate. ISO prepared a document which was based largely on the ASTM standard, but with two important exceptions: the measurement for smoke and ignitability measurements were assigned to different ISO Working Groups and, thus, could not be included in the same process of developing the ISO standard. In 1990 ISO published the Cone Calorimeter method as a draft international standard DIS 5660. This was approved for publication as a final standard, ISO 5600. The published document is expected to be ready in June 1993. The work on the laser smoke measurement proceeded in ISO by separate channels. A round robin was completed and ISO have approved that a document be prepared for DIS voting. ISO have also approved that a document be developed for a simplified `mass loss apparatus’ which uses the heater and the load cell from the Cone Calorimeter but not the other measurement systems. Such a device is seen to have potential uses for screening, quality control and production monitoring. For ignitability measurement, ISO currently prescribes test ISO 5657, which uses a cone heater similar, but not identical, to the one on the Cone Calorimeter. ISO have agreed to study the similarities and differences between these instruments and to determine whether the ignitability function could be just as well given over to the Cone Calorimeter, as is in the ASTM standard. This work item, however, has not progressed much yet. In the US, some more specialized standards based on the Cone Calorimeter have also recently been issued. Both ASTM  and the National Fire Protection Association (NFPA)  have issued standards dealing with the use of the Cone Calorimeter for testing furniture items. The US Department of Defense published a standard for composite materials  requiring the use of Cone Calorimeter testing. NASA issued a standard  based on the use of the controlled-atmospheres Cone Calorimeter for testing materials for space vehicles. In Canada, building code requirements for non-combustibility are slated to be revised, with the Cone Calorimeter being used for testing in that application. Similarly, US building codes are also starting to issue product approvals based on such testing, although so far only on a case-by-case basis. Pass or fail a product according to a criterion level. The earliest applications of Cone Calorimeter data have been in the polymers industry. Hitherto, in the US manufacturers typically have relied either on limiting oxygen index (LOI)  tests or on UL94 . The latter is a simple Bunsen-burner type test which gives only pass/fail results; it is clear that quantitative information useful for polymer development does not come from such a test. The former, however, does give quantitative results and uses what would appear to be a suitable engineering variable. Again, however, a recent study has clearly demonstrated that the results, while quantitative, are not capable of even correctly rank-ordering according to actual fire behavior . By contrast, it has been shown quite clearly that heat release rate is the single most important variable describing the hazard of the actual fire . Thus, there remains the issue: How do we best collect or analyze bench-scale HRR data in order to predict the full-scale HRR? The ratio expressed here is the peak HRR divided by the time to ignition. Data obtained in the course of various room fire test programs had shown that this variable could account for-approximately-the heat release occurring from surfaces over which flame is spreading. This is possible since the flame spread process and the ignition process are governed by the same thermophysical properties of the material. More recently, the late R. V. Petrella has proposed  to the plastics industry that a two-dimensional rating scale be considered, with the variable described above placed on one axis and the total heat released during test placed on the other axis. Besides knowing how to analyze the data for such applications, the other important information needed is at what heat flux should the specimen be tested. This question is not simple; some necessary considerations are treated in . Combustible wall and ceiling linings in rooms. This is a very difficult problem, but very impressive success was achieved in the European ‘EUREFIC’ research program . It is especially noteworthy that data from only the Cone Calorimeter were required in making these real-scale predictions. Another approach to this same problem was developed at Lund University . Upholstered furniture. This problem was addressed at NIST in two separate research projects ,. Work is continuing in this area both at NIST and in a large European Community project in Europe. Electric wire and cable. In most countries the large scale fire test for these products is a vertical cable tray test. In a research project conducted at BFGoodrich, it was demonstrated that the Cone Calorimeter can successfully predict the HRR results from several such large tests . Non-combustibility and ‘degrees of combustibility’ of building products. Work has been done for the Canadian building code committee establishing the use of Cone Calorimeter data in those areas where the code had specified either non-combustibility tests or material-specific requirements ,. These and other more specialized applications are discussed in detail in a recent textbook which comprehensively examines heat release in fires . Many earlier fire test methods had particularly simple data outputs. Typically, only one or two numbers would need to be reported or, possibly, one or two curves. The Cone Calorimeter, however, produces large amounts of data: curves of heat release, smoke, and mass loss, also often of CO, CO2, and other gas yields. Added to this are a large amount of scalar data, in the vicinity of 100 variables. These are all data which are readily and automatically collected by the software used with the Calorimeters. The issue that the engineering community faced, however, was data interchange and data inputting into fire models and calculation methods. Data of differing formats can always be converted but this involves significant time and effort. Furthermore, the data achieve a much greater utility when they are available through a database, where searches can be made using logical conditions and Boolean variables. The Cone Calorimeter is not alone in being able to use such data handling facilities-other fire tests can also very usefully be handled by means of a database, even when their data output is more limited. To facilitate this process, NIST, the Fire Research Station, US Navy, Norway’s SINTEF, and a number of other organizations cooperatively agreed upon data formats to be used for exchanging and storing fire test data . A companion computer program was developed which provides for the database operations, graphics, and report output . Even though motivated originally by Cone Calorimeter data needs, the system encompasses many different types of tests not just this one. Increased utilization in polymer development, taking over some of the existing role of thermal analysis (TGA, DSC, etc.) equipment. Adoption into building codes and other regulations for various applications where the requirements would be better served by a HRR approach (supplemented, where necessary, with the numerous other data routinely available from a Cone Calorimeter test). In many cases, the currently-prescribed tests are of a much larger scale and are costlier to perform; thus cost savings could be seen, in addition to improved validity of measurement. An increased number of product types for which bench-scale/full-scale predictive correlations or algorithms become available. Increased interest in Cone Calorimeter data by fire protection engineers, as fire models become more comprehensive, more successful, and more widely used. Cone Calorimeter data will be necessary with most of them as part of the input data. Increased use of the standard data formats developed under FDMS. A number of commercial testing laboratories are already exploring the arrangement whereby clients would be given their data both in the form of the traditional printed report and also in the form of a floppy disk of their data in FDMS format. This will allow the client to easily compare on the computer his current data against his other data and also against any databases supplied by public-interest research organizations. Huggett, C., Estimation of Rate of Heat Release by Means of Oxygen Consumption Measurements. Fire and Materials 4, 61-65 (1980). Babrauskas, V., Development of the Cone Calorimeter A Bench-Scale Heat Release Rate Apparatus Based on Oxygen Consumption (NBSIR 82-2611). [U.S.] Natl. Bur. Stand. (1982). Babrauskas, V., and Mulholland, G., Smoke and Soot Data Determinations in the Cone Calorimeter, pp. 83­104 in Mathematical Modeling of Fires (ASTM STP 983). American Society for Testing and Materials, Philadelphia (1987). Nyden, M.R., and Babrauskas, V., Use of FTIR Spectroscopy for Multi-Component Quantitation in Combustion Technology, pp. 107-1 to 107-4 in 1987 Combined Technical Meetings: Eastern Section, the Combustion Institute, and The Center for Fire Research Annual Conference on Fire Research, Gaithersburg, MD (1987). Kallonen, R., Smoke Gas Analysis by FTIR Method. Preliminary Investigation, J. Fire Sciences 8, 343-360 (1990). Babrauskas, V., Twilley, W.H., Janssens, M., and Yusa, S., A Cone Calorimeter for Controlled­Atmospheres Studies, Fire and Materials 16, 37­43 (1992). Mulholland, G., Janssens, M., Yusa, S., and Babrauskas, V., The Effect of Oxygen Concentration on CO and Smoke Produced by Flames, pp. 585-594 in Fire Safety Science Proc. of the Third International Symposium, Elsevier Applied Science, London (1991). Babrauskas, V., Cone Calorimeter Annotated Bibliography 1982-1991 (Tech. Note 1296). Natl. Inst. Stand. and Technol., Gaithersburg (1992). Babrauskas, V., and Peacock, R.D., Heat Release Rate: The Single Most Important Variable in Fire Hazard, Fire Safety J. 18, 255-272 (1992). Standard Test Method for Determining the Heat Release Rate of Upholstered Furniture and Mattress Components or Composites Using a Bench Scale Oxygen Consumption Calorimeter (ASTM E 1474-92), American Society for Testing and Materials, Philadelphia (1992). Standard Method of Test for Heat Release Rates for Upholstered Furniture Components or Composites and Mattresses Using an Oxygen Consumption Calorimeter (ANSI/NFPA 264A). National Fire Protection Assn., Quincy, MA (1990). Fire and Toxicity Test Methods and Qualification Procedure for Composite Material Systems used in Hull, Machinery, and Structural Applications inside Naval Submarines, MIL-STD-2031 (SH). Department of Defense, Philadelphia, PA (1991). Flammability, Odor, Offgassing, and Compatibility Requirements and Test Procedures for Materials in Environments That Support Combustion (NHB 8060.1C). Office of Safety and Mission Quality, National Aeronautics and Space Administration, Washington (1991). Standard Method of Test for Flammability of Plastics using the Oxygen Index Method (ASTM D 2863). American Society for Testing and Materials, Philadelphia. Tests for Flammability of Plastic Materials for Parts in Devices and Appliances (UL 94). Underwriters Laboratories, Northbrook. Weil, E.D., Hirschler, M.M., Patel, N.G., Said, M.M., and Shakir, S., Oxygen Index: Correlations to Other Fire Tests, Fire and Materials 16, 159-167 (1992). Babrauskas, V., Bench-Scale Methods for Prediction of Full-Scale Fire Behavior of Furnishings and Wall Linings, Technical Report 84-10, Society of Fire Protection Engineers, Boston (1984). Petrella, R. V., presentation to The Society of the Plastics Industry, Inc., Miami, FL (December 1992). Babrauskas, V., Specimen Heat Fluxes for Bench-scale Heat Release Rate Testing, paper presented at INTERFLAM ’93, Oxford (April 1993). Wickström, U., and Göransson, U., Full-scale/Bench-scale Correlations of Wall and Ceiling Linings, Fire and Materials 16, 15-22 (1992). Karlsson, B., A Mathematical Model for Calculating Heat Release Rate in the Room Corner Test, paper presented at ASTM International Symp. on Fire and Flammability of Furnishings and Contents (1992). Babrauskas, V., and Krasny, J.F., Fire Behavior of Upholstered Furniture (NBS Monograph 173). [U.S.] Natl. Bur. Stand. (1985). Parker, W.J., Tu, K.-M., Nurbakhsh, S., and Damant, G.H., Furniture Flammability: An Investigation of the California Technical Bulletin 133 Test. Part III: Full Scale Chair Burns (NISTIR 4375). [U.S.] Natl. Bur. Stand. (1990). Hirschler, M.M., Electric Cable Fire Hazard Assessment with the Cone Calorimeter, pp. 44-65 in Fire Hazard and Fire Risk Assessment (ASTM STP 1150). American Society for Testing and Materials, Philadelphia (1992). Richardson, L.R., and Brooks, M.E., Combustibility of Building Materials, Fire and Materials 15, 131-136 (1991). Richardson, L.R., Determining Degrees of Combustibility of Building Materials-National Building Code of Canada, pp. 1-12 in Proc. First Intl. Fire and Materials Conf., Interscience Communications Ltd, London (1992). Babrauskas, V., and Grayson, S.J., eds., Heat Release in Fires, Elsevier Applied Science Publishers, London (1992). Babrauskas, V., Peacock, R.D., Janssens, M., and Batho, N.E., Standardizing the Exchange of Fire Data The FDMS, Fire and Materials 15, 85-92 (1991). FDMS computer program, developed by Dark Star Research Ltd with funding of FRS. Available from S.A. Ames, Fire Research Station, Borehamwood, Herts. WD6 2BL, England.